Adaline is finally set to follow-up Modern Romantics with a new LP titled Aquatic, and Exclaim! is giving you an exclusive first look at the video for "Entertainer" off the upcoming album. Like the title implies, the musical ideas behind Aquatic were conceived by the ocean, and the theme carries through lyrics that are soaked with metaphors of baptism and beginning again. "Entertainer" encapsulates Adaline's search for real connection in a world of "cruel falsehoods and misplaced expectations" — seeking out something more than mere entertainment in a relationship. "I find it a common sentiment in my generation: we're looking for something just a little more profound," she says. 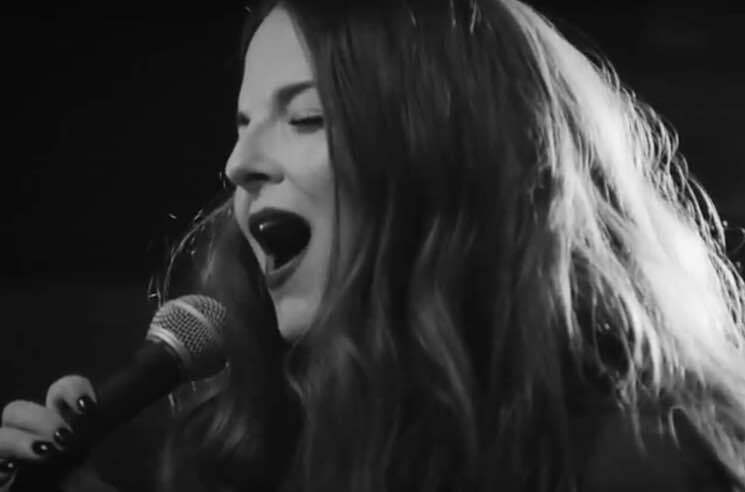 As for the accompanying video, it was shot in black and white, and captures the singer and her backing band in the throes of a live-off-the-floor performance. It marks the first of a six-song concert series that will be completely unveiled after the release of the new album. "This intimate performance of 'Entertainer' was recorded live off the floor at Cylinder Sound in Toronto, where the album was written and recorded," Adaline tells Exclaim! "It was amazing to perform these songs live for the first time in the setting where the songs were created. Felt very much like performing in my living room with some of my favourite musicians. This project really felt like working with family — the people who filmed and recorded the audio were the same people who engineered and mixed the record." Aquatic will arrive in its entirety on June 2 via Cadence Music Group. In the meantime, get reacquainted with Adaline by watching the video for "Entertainer" down below.